Track Leads, Accounts and Contacts. Flow from one task to the next. Save time - a lot of it. WeFlow is subscription based software that provides solutions to sales tracking, management and analysis problems. WeFlow was originally developed as an internal tool for a small business that needed to track sales, but wasn't satisfied with traditional CRMs. It was then expanded to track projects after they sold, as they were designed, produced and delivered to the customer. We love simplicity. Visual and functional simplicity are the backbone of our powerful platform. Spend time getting results rather than over-planning. Mark stages of your sales process complete as you make progress towards closing a sale. 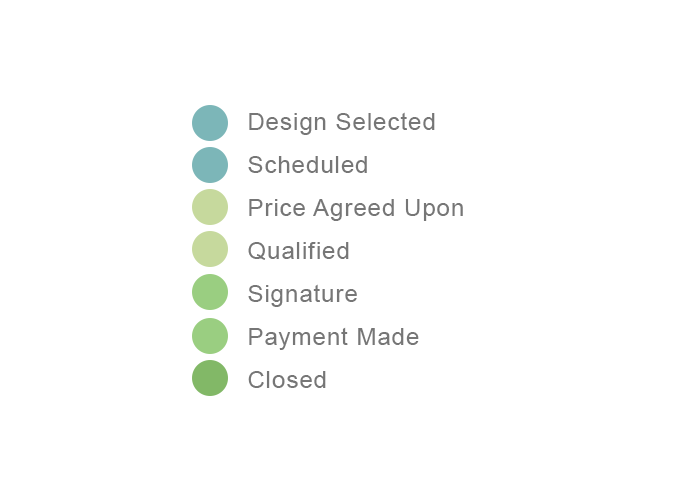 When a team member completes part of your sales process (see below) they click the corresponding dot. The date progress gets made is recorded. This is quick, provides a sense of the state of affairs at a glance, rewards results rather than planning, and is simply satisfying. This information can be visualized in a number of types of reports explained below. Standardize your sales process and get your team on the same page. Without a standard process for selling, a team's success relies on individuals. Hone in your sales process by breaking it down into steps specific to your process for selling in our system. Once it is standardized in this way, progress can be tracked using our dot system shown above. Combine this with our reports and the state of your sales will be transparent. Visualize your success in new ways. We have a suite of original reports that help you visualize results, momentum, workload, metrics, and more. Right off the bat you'll have a set of reports that have been configured for you. Lists of work that need to be completed next. All of these reports can be filtered by team member to visualize indidivual work. These are most easily understood through interaction; a risk-free trial is recommended. Get the numbers you need. Use our preset metrics or quickly set up your own. Metrics are simple to set up, take a set of data, and run calculations on it. Our system allows you to filter a set of results in a user friendly way. Take Leads for example. Our system allows you to create a filter that shows only Leads that are expected to close in the next 30 days, are over a value of $20,000, and are in either California or Washington. Once this filter is set up, which would only take 1 to 2 minutes, a metric could run calculations on any of the numbers or dates associated with those leads. It could calculate numbers like the total, average, or median Lead value. 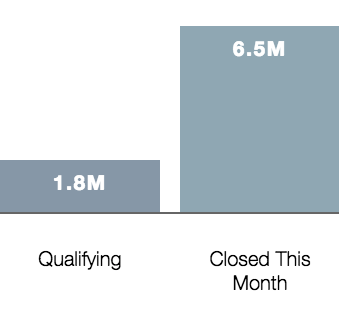 It could calculate numbers like the average or median number of days between Lead qualification and close. These metrics can then be visualized using a bar chart. We've set up a number of useful metrics for you already, but you'll be able to modify them to fit your needs or create new ones if desired. Stop wasting time searching and switching pages. 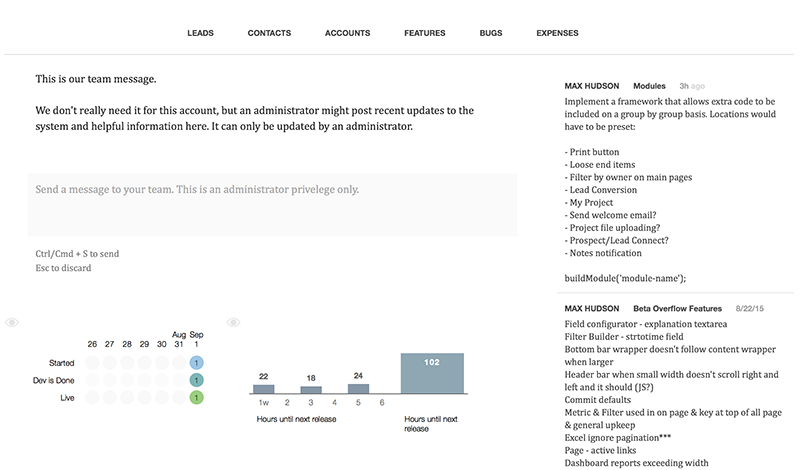 View reports and manage all your active clients from one lightweight page. The view pictured left is an example of one of the most unique features of our system. Your team will be looking at this more than any other. Take Leads for example. 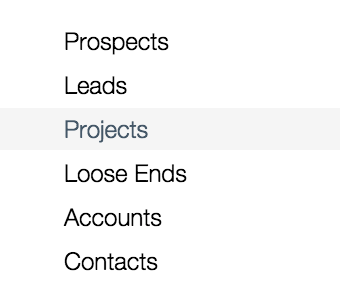 From this view you can opt to view all Leads that are qualified, but not closed and that you are managing. You can then both view and edit any of those Leads' sale values, close goals, states of mind, etc... all in one place. 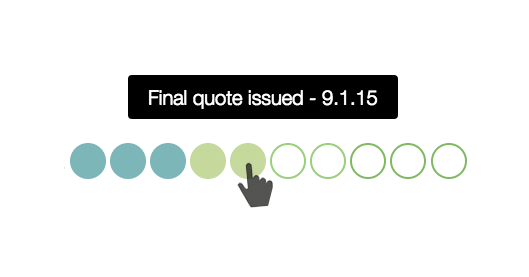 Interactive reports can be optionally included at the top of the page. Your account can be adapted to track more just than sales. For example, some companies use it to track large projects as they move from sales, to design, to production, and to the client. WeFlow's underlying structure was originally conceived to track production, not sales. It was then realized that the platform was much more useful than we originally thought. In one case, a software contractor used it to track sales before a contract was signed, projects after a contract was signed, and even a breakdown of all the software features that needed to be completed for each project. Software features were linked to their corresponding projects, each feature had an owner, and there was a standardized process for completing features that included developing, testing, and releasing. The system is designed to be as versatile as possible. New sections can be added, sections can be customized (i.e. if you want to track a Lead's happiness, you can), and reports, metrics, filters, web to lead, your dashboards, and more can all be customized if your starting configuration isn't perfect for you. Customized reports, metrics, notes, and relevant links based on your activity all in one place. 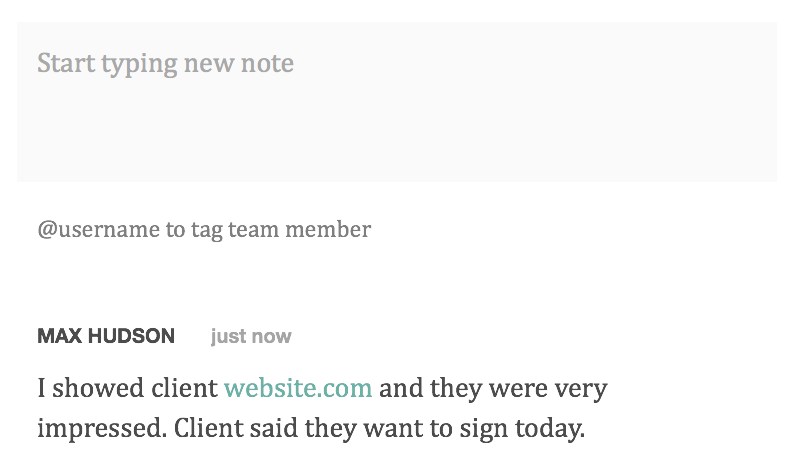 Tag team members and include links using our lightweight notes. Keep important client files securely in one place. Send leads our way from your custom forms. Get the results you need in the order you want. Export the information you need for meetings to Excel. Keep your existing data from Salesforce, SugarCRM, or Base. Schedule reminders for yourself and stay in the loop. Backup and restore with daily backups of all your data.